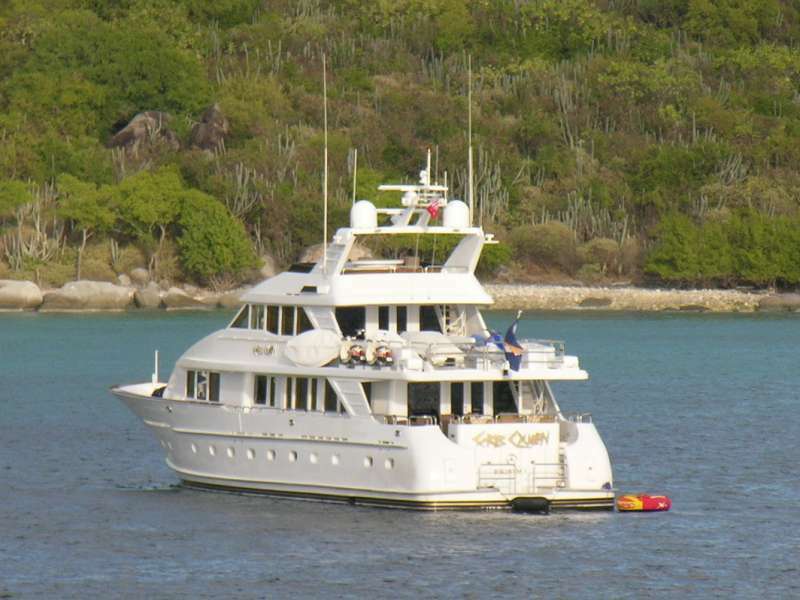 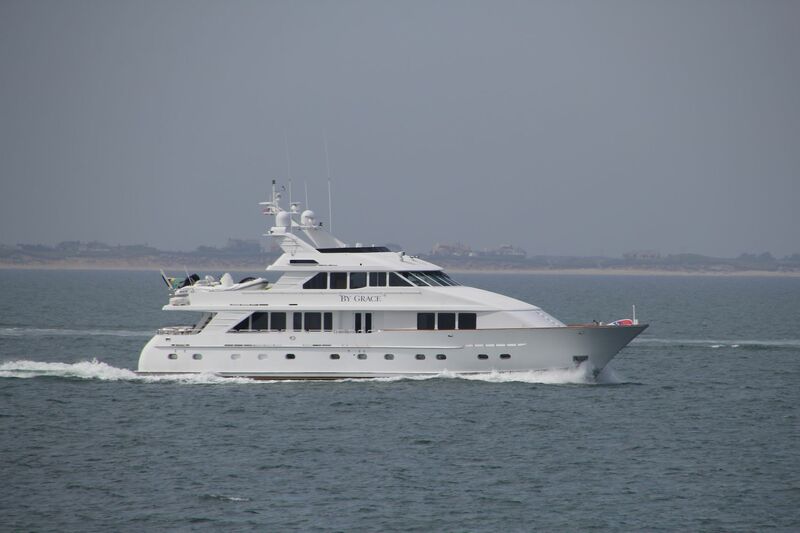 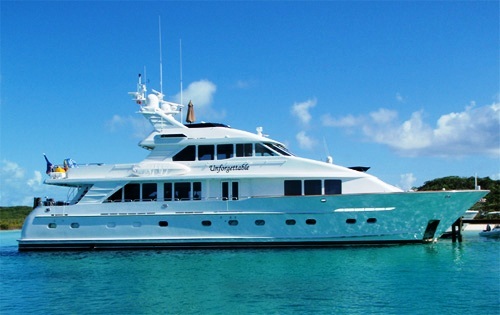 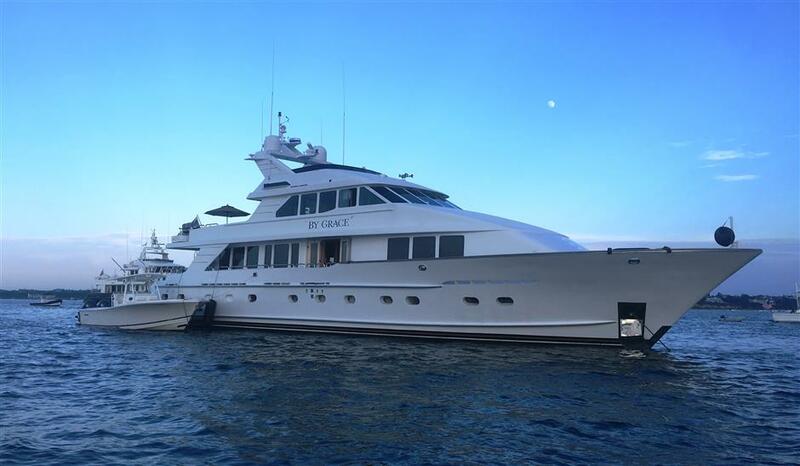 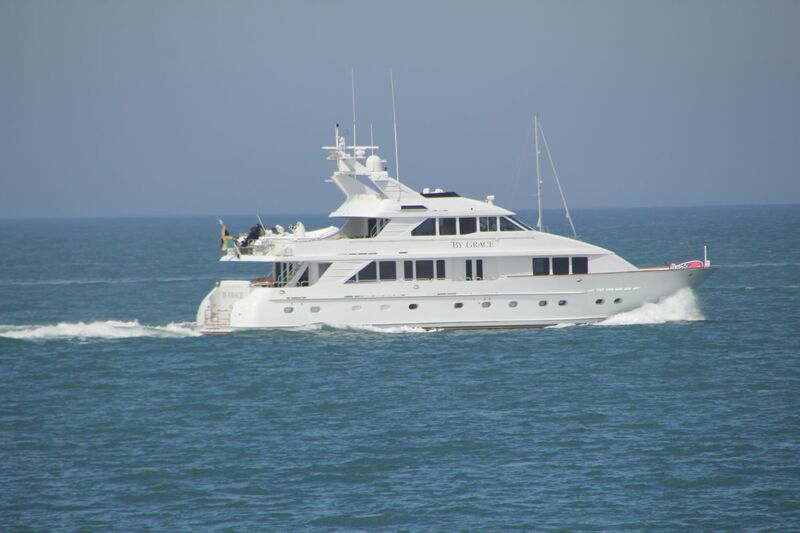 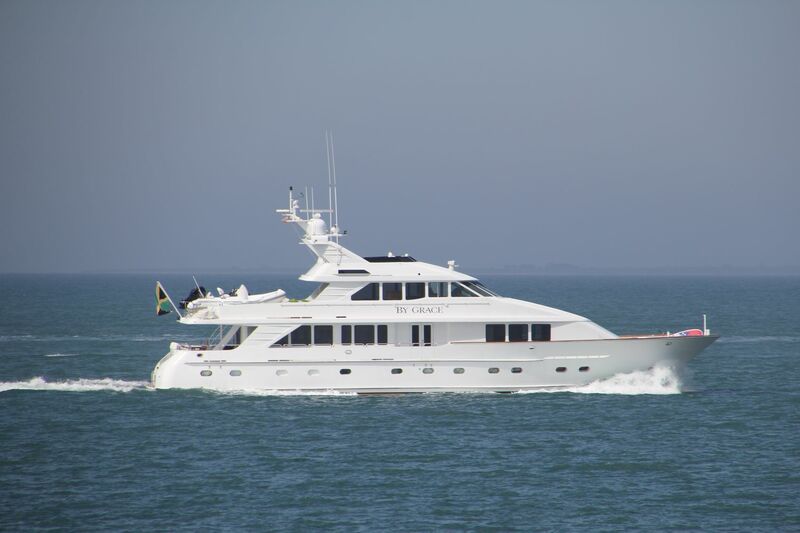 Motor yacht BY GRACE (ex UNFORGETTABLE, CARIB QUEEN) is a 30,48m (100') was built be Inace in 1999. The yacht has received an exterior refit in November 2002/2008 and an interior refit in the summer of 2003/2009 (new soft goods). 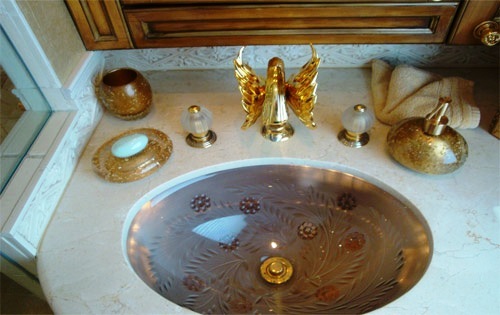 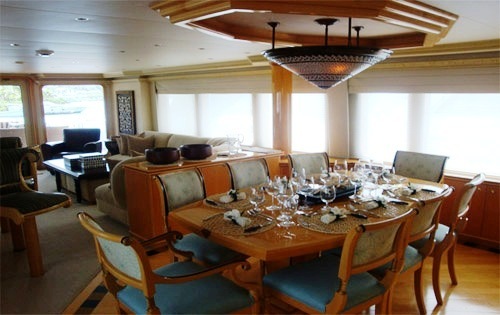 She has a large main salon with an L-shaped sofa with 3 ottomans and a full wet bar with bar stool seating for 4 guests. 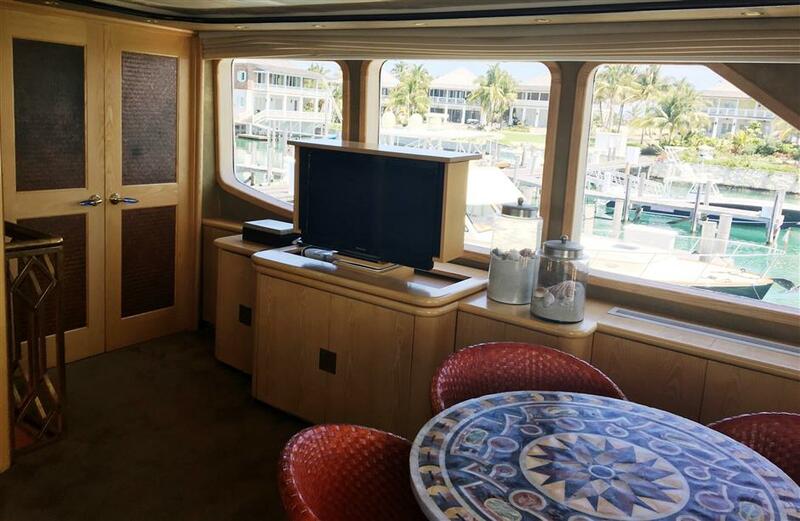 There is also a game table with seating for 4 guest and an entertainments system with a CD, Stereo, Cassette with Surround Sound. 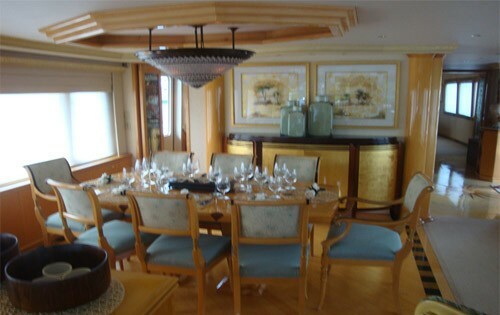 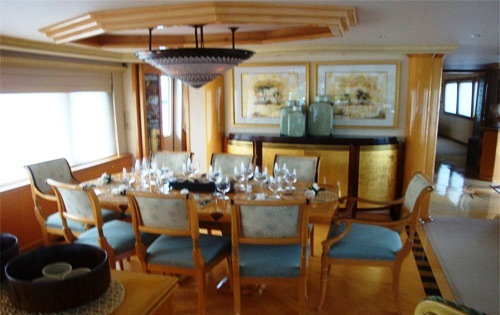 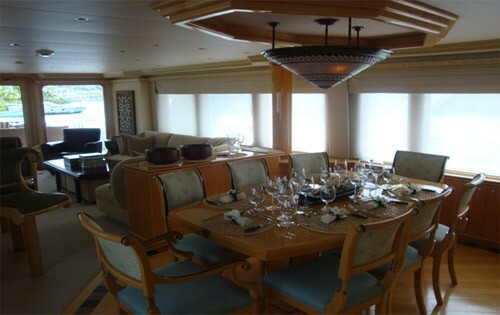 Further forward of the salon is the formal dining area able to seat 8. 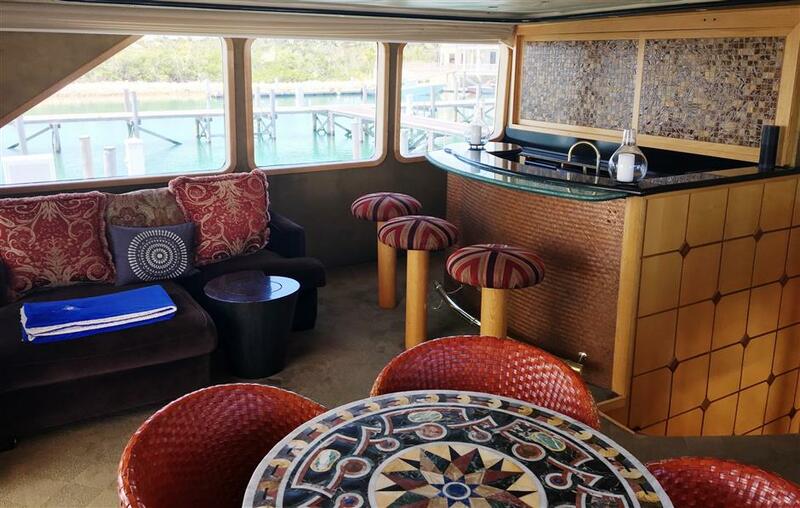 The Sky lounge with a full wet bar with stool seating for 3, a comfortable couch, game table and seating for 4. 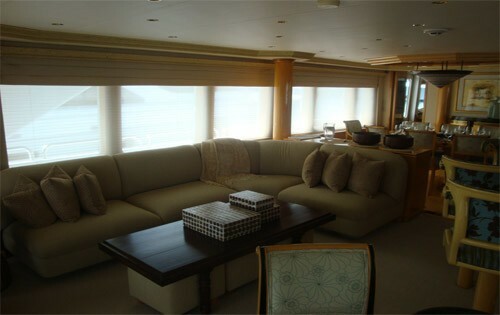 There is an entertainment centre with 27” TV/DSS/DVD/CD/Stereo Cassette with Bose Home Theatre Speaker System. 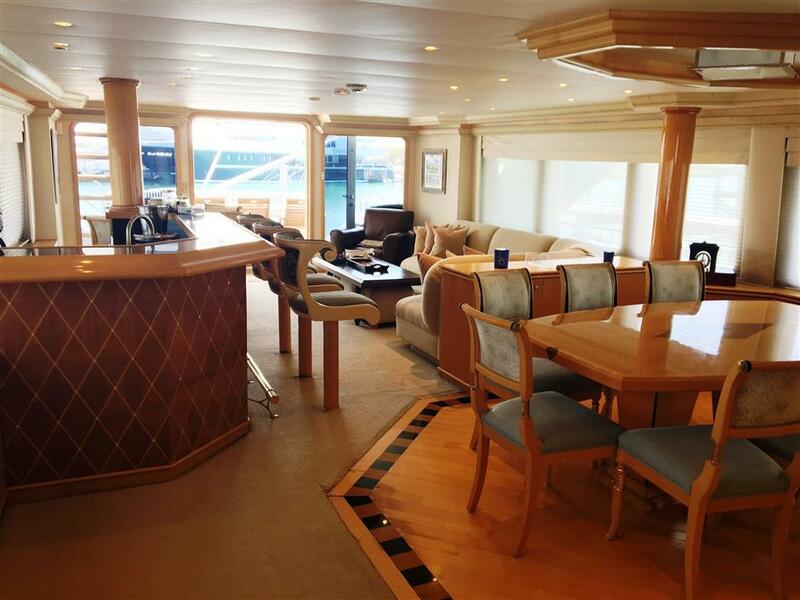 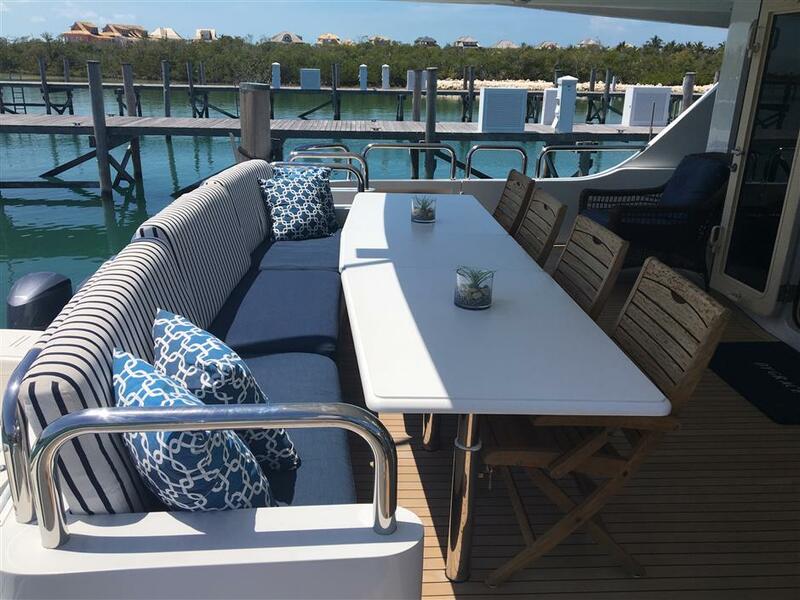 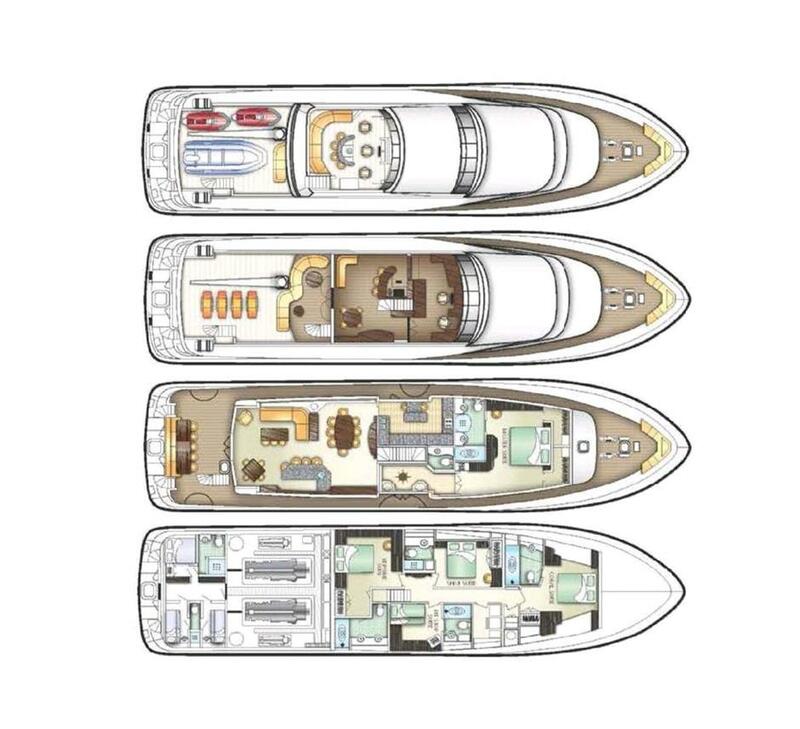 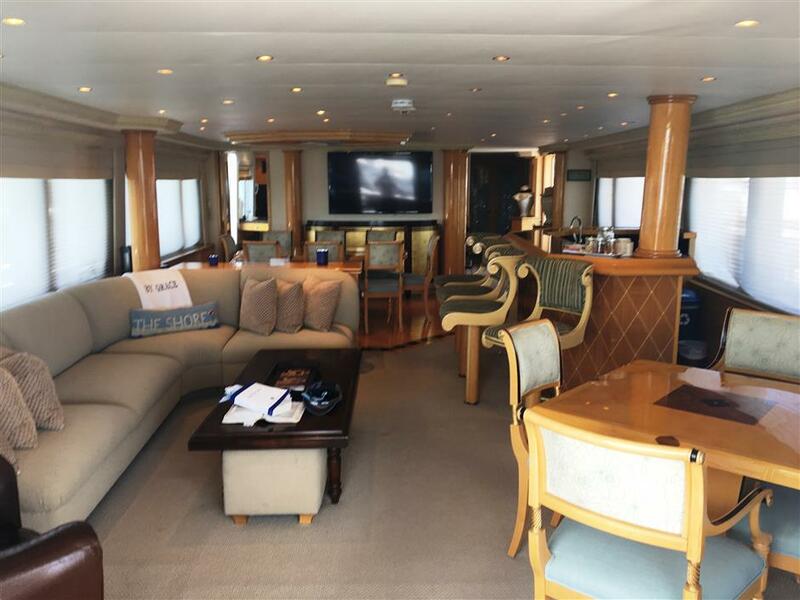 The Inace motor yacht also has great exterior spaces including a large covered aft deck with al fresco dining for 12, 2 marble tables and 5 deck chairs. 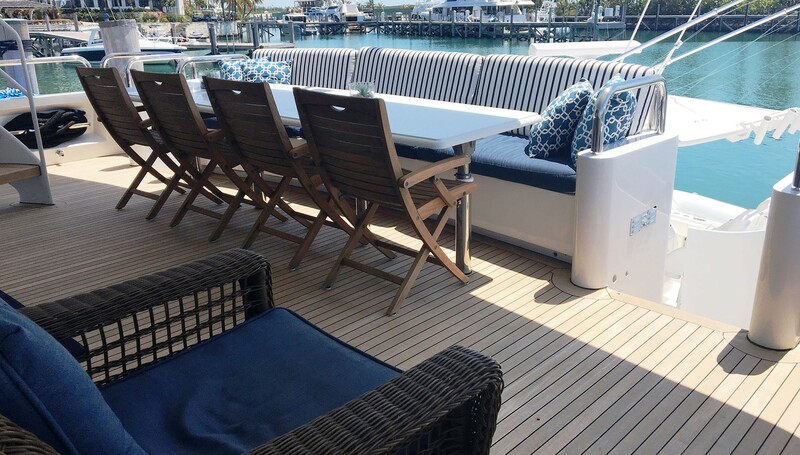 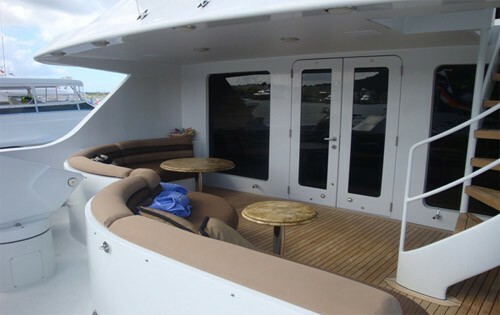 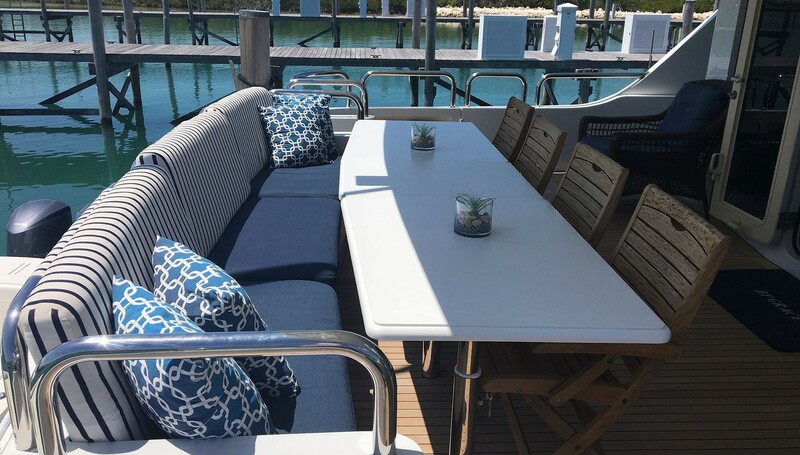 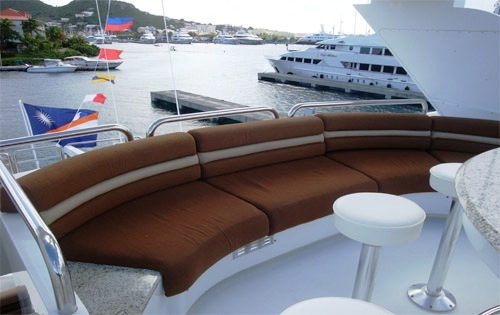 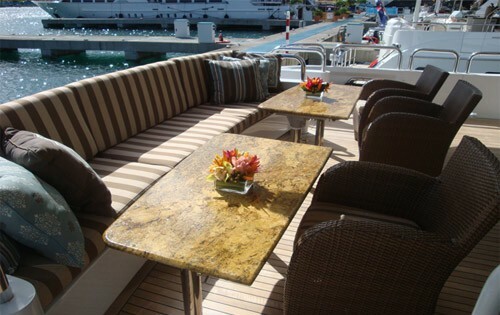 The Boat Deck also features shaded seating with two tables and 3 lounge chairs. 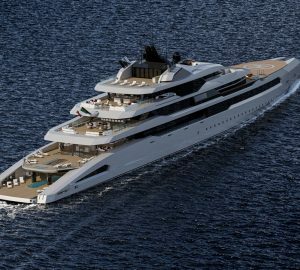 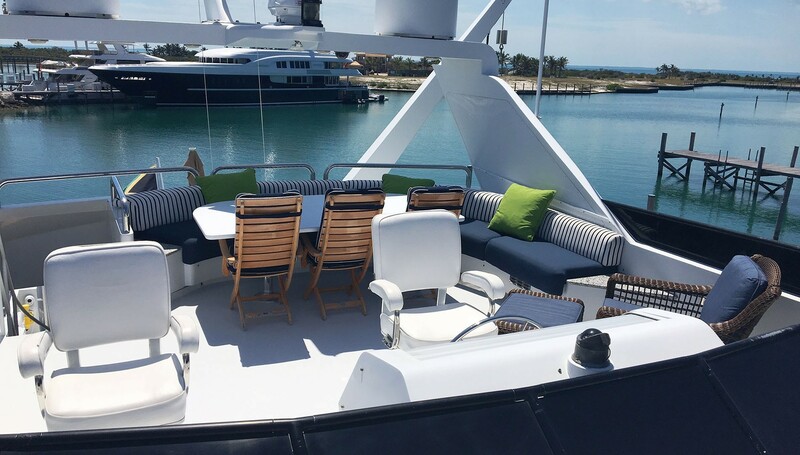 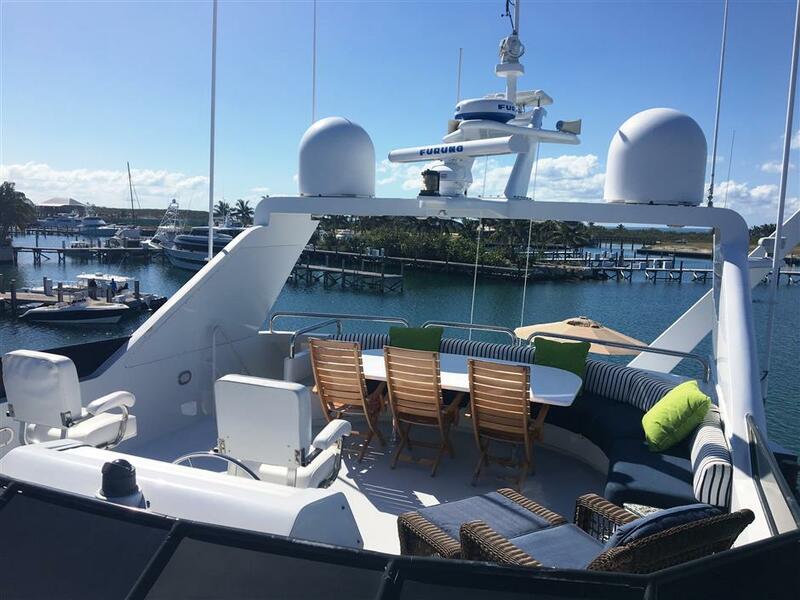 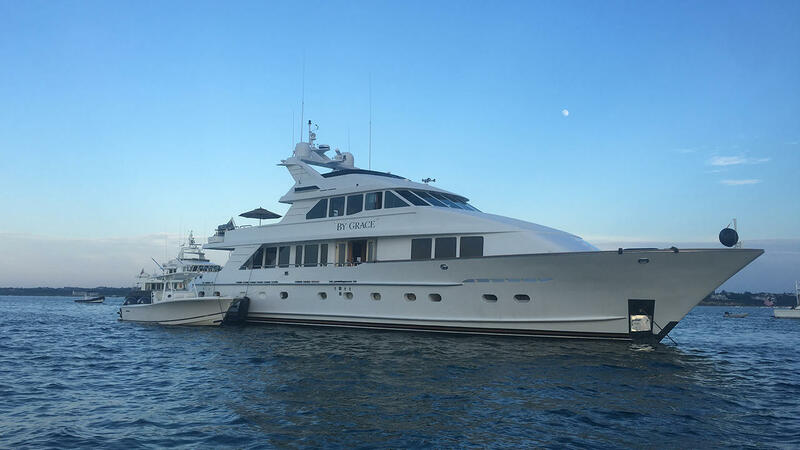 The Fly bridge Deck boasts wrap-around seating for 12, a barbecue grill, a full wet bar with icemaker and refrigerator plus 3 Captain’s chairs and a helm station. 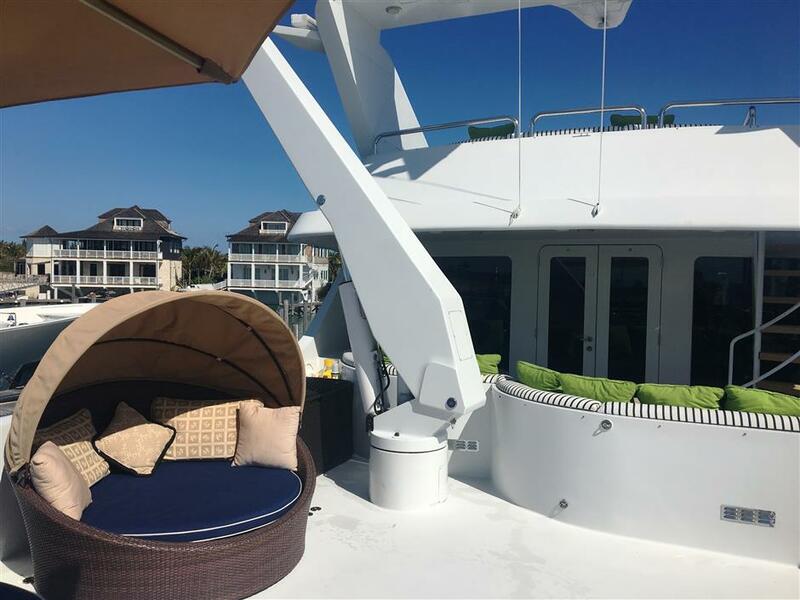 There is a huge collection of water toys unmatched by any five-star resort. 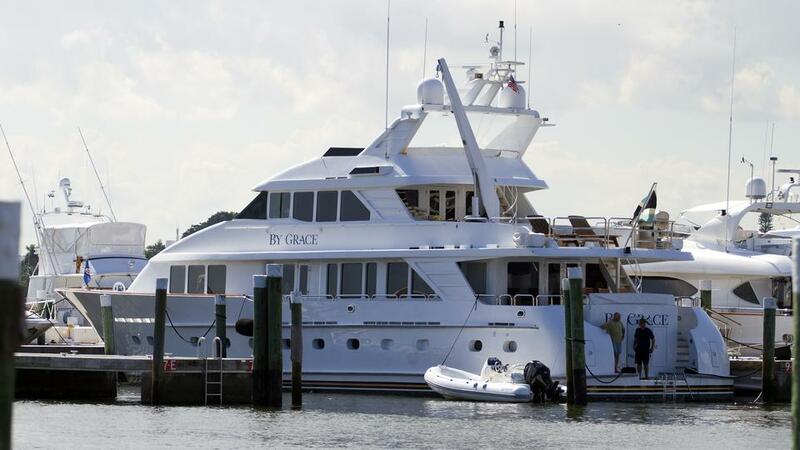 These include Wave Runners and sea kayak. 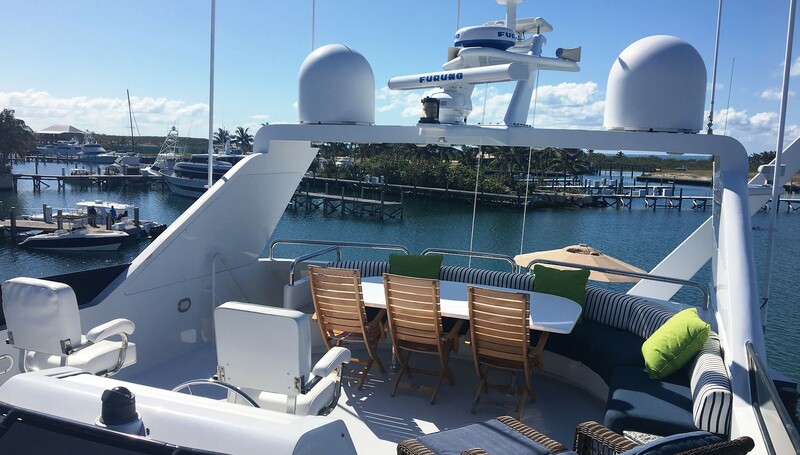 She has a crew of 5, 3 of which are certified scuba divers to help you enjoy safe usage of the three-person Brownie Third Lung as well as individual scuba diving gear and snorkel equipment. 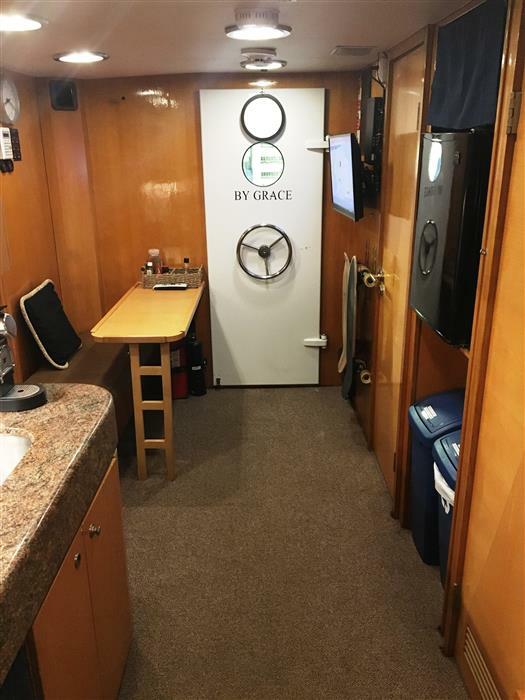 BY GRACE also has two Honda scooters for land excursions by licensed users. 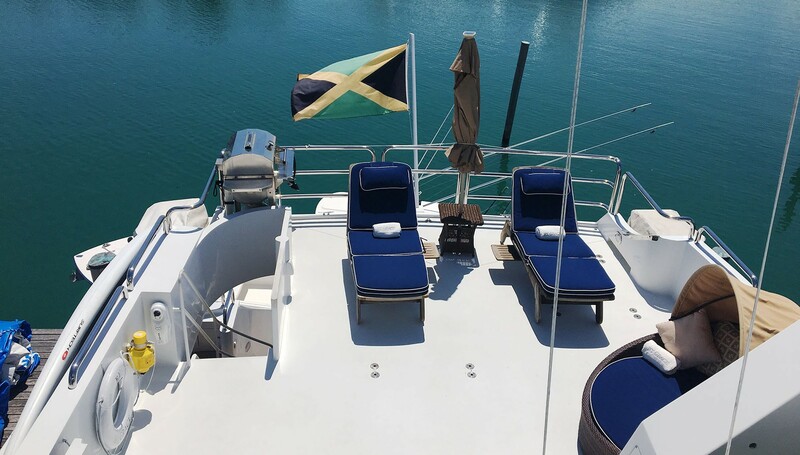 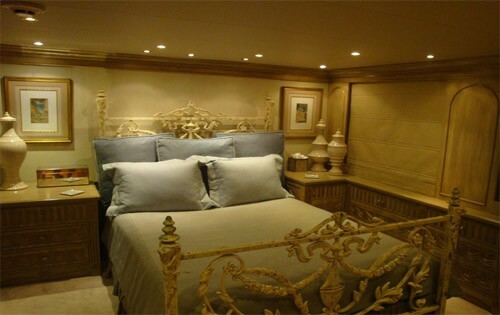 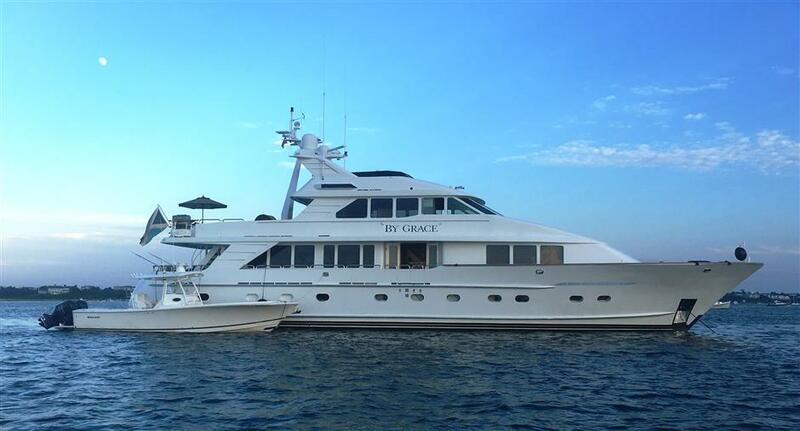 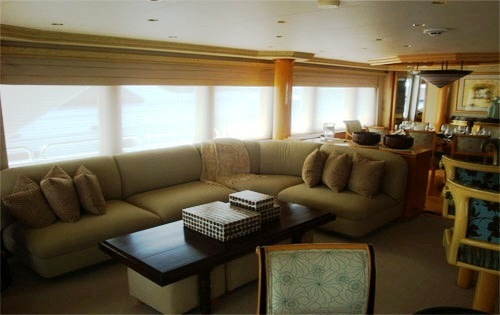 BY GRACE can accommodate up to 10 guests in 4 staterooms including a Master Stateroom located on the main deck Forward. 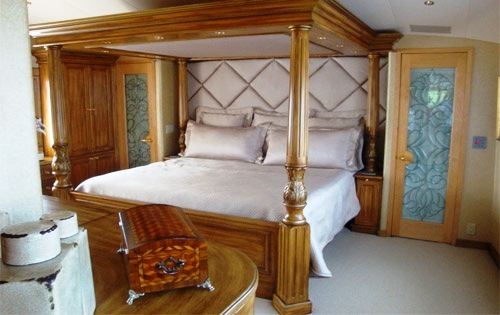 This cabin features a 4 poster king sized bed with canopy, an ensuite bathroom with Spa Pool tub and shower as well as dual sinks. 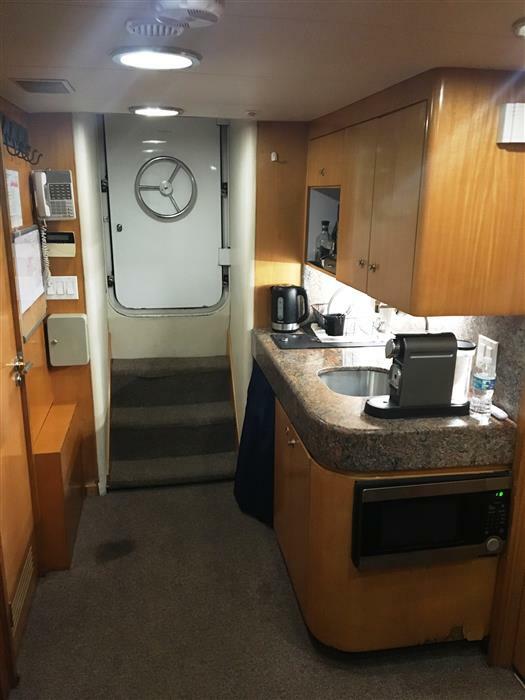 There are 2 walk-in closets, a 27” Pop-Up TV/DSS/DVD/CD/Stereo Cassette with Surround Sound and remote control window shades. 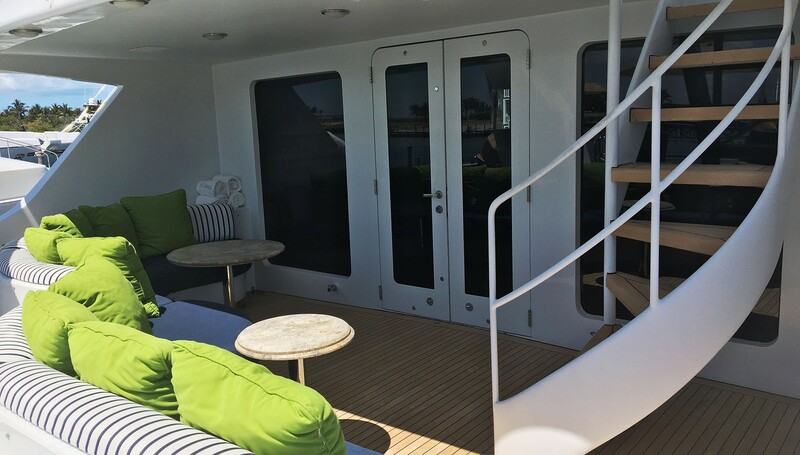 The 4 remaining cabins are located on the lower deck are individually named. 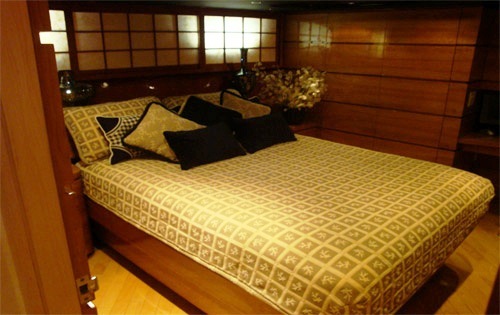 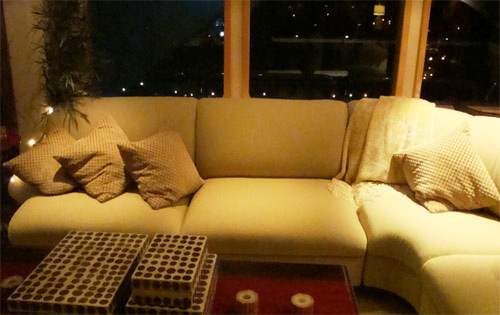 The “Soji Suite” is situated amidships to port. 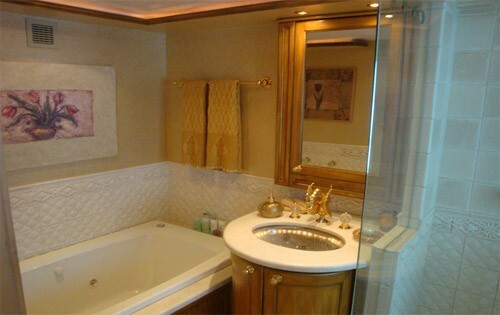 This cabin has a Queen bed, work desk, TV/DSS/VCR/CD/Stereo Cassette with Surround Sound and an ensuite bathroom with a shower. 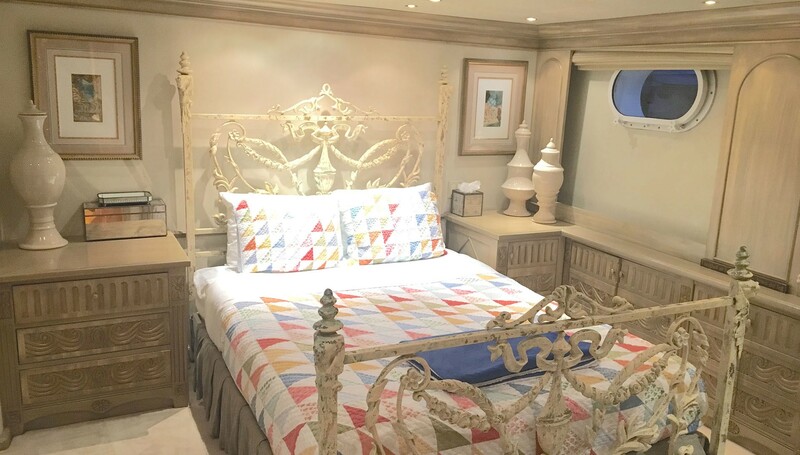 The “Coral Suite” is located forward and has a Queen bed, TV/DSS/VCR/Stereo Cassette with Surround Sound and an ensuite bathroom with Spa Pool tub and shower. 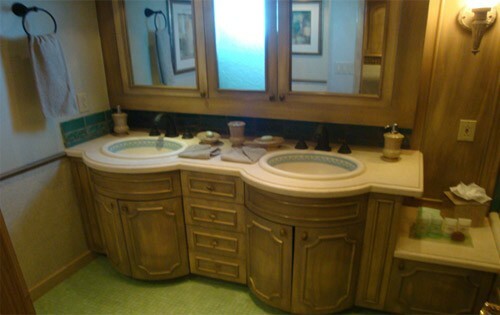 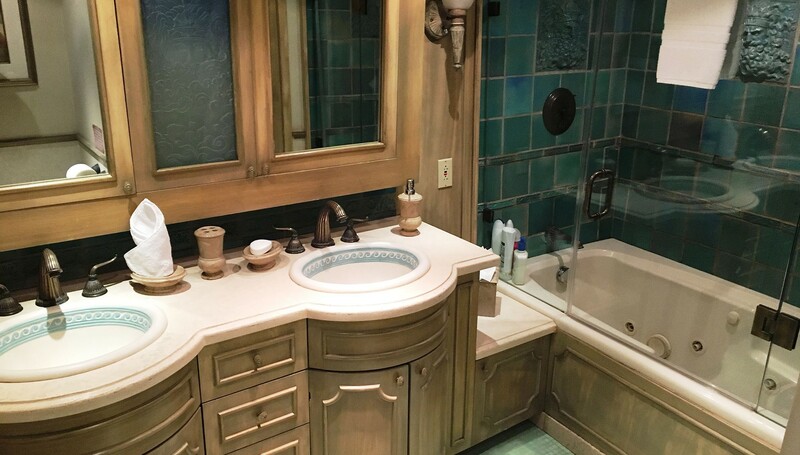 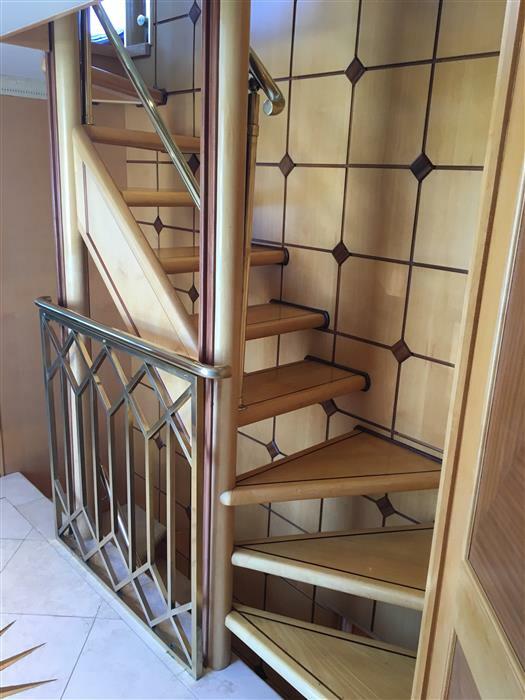 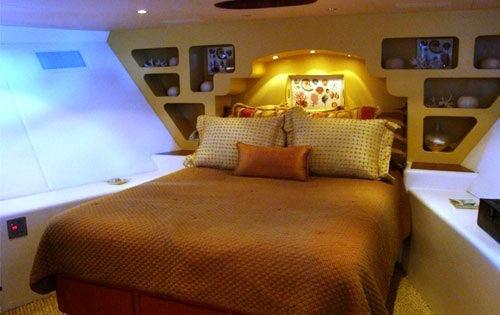 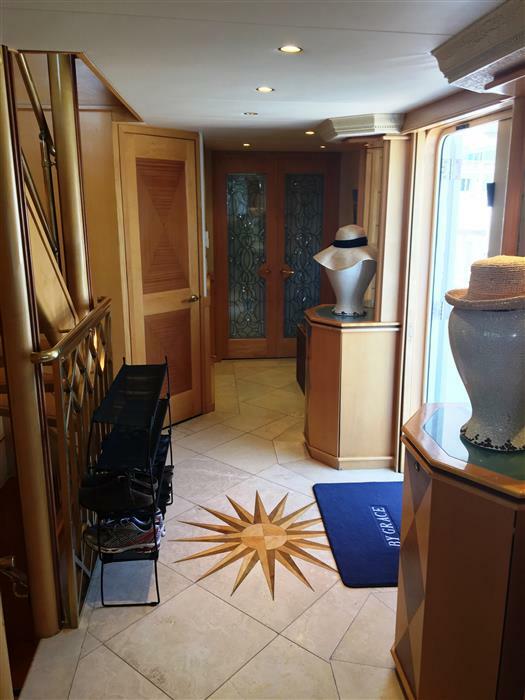 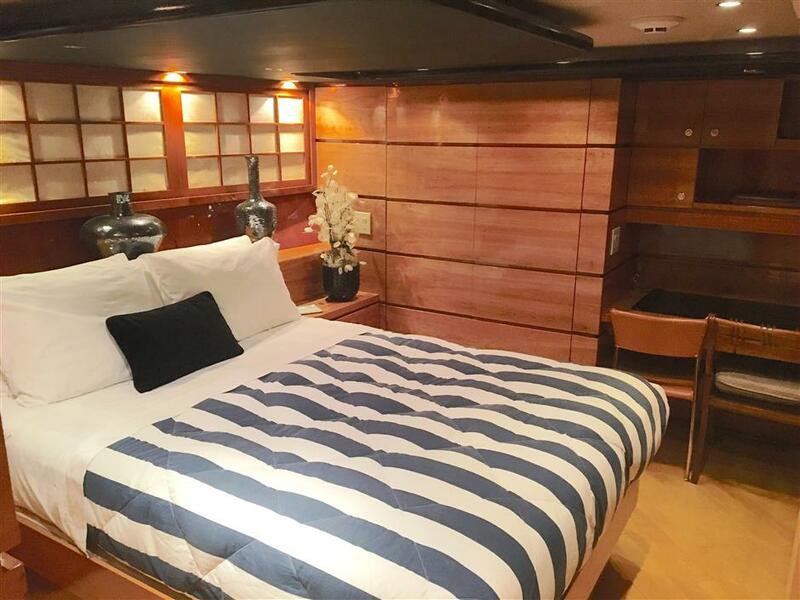 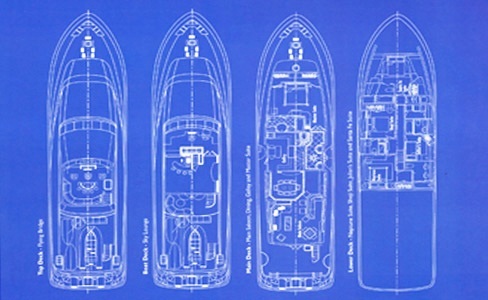 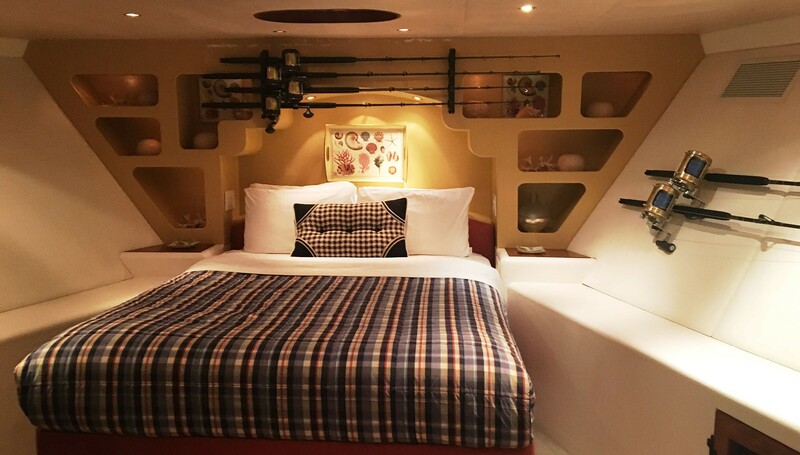 The “Neptune Suite” Amidship Port has a Queen bed, TV/VCR/Stereo Cassette with Surround Sound and an ensuite bathroom with double vanity, Spa Pool tub, and shower. 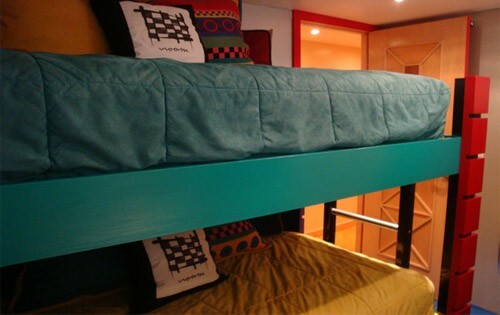 The “Pit-Stop Suite” Amidship Starboard has Twin bunk beds, TV/DSS/VCR/Stereo with Surround Sound. 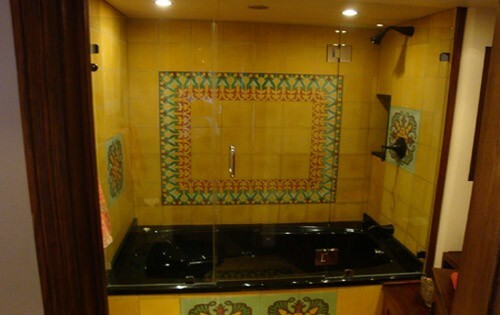 Wii and PlayStation plus an ensuite bathroom with Spa Pool tub and shower. A variety of extra onboard awaits charter guests to enjoy including a 20’ Carib inflatable with 150hp, CD player, fish finder, ski tow bar, rigged for fishing (weather permitting), 2 Jet Ski’s, 2 pairs Water skis – adult, Water skis – kids, Tow tube, Tow Banana 2 sets deep sea fishing gear, 2 floating sun pads, 3 lounge chairs, 8 sets of snorkel gear, Brownie Third Lung, 2 Wake Boards, Free weights, and bench. 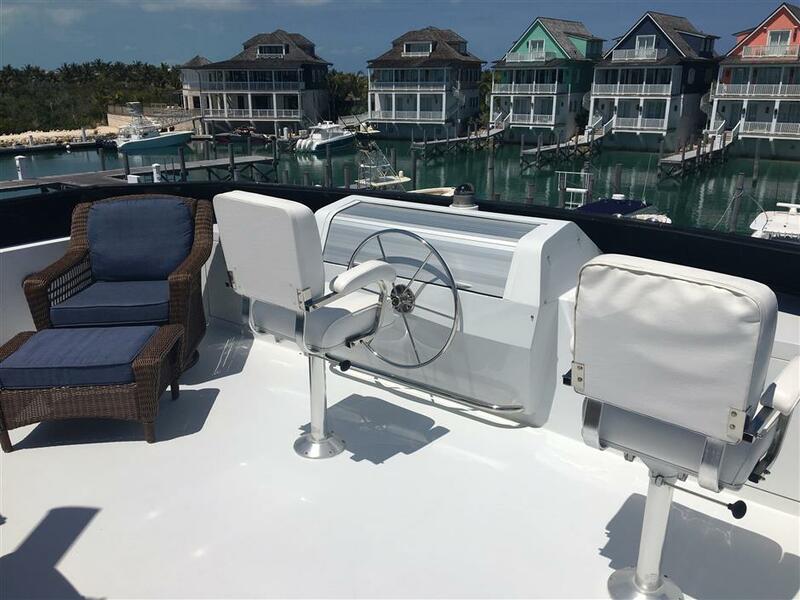 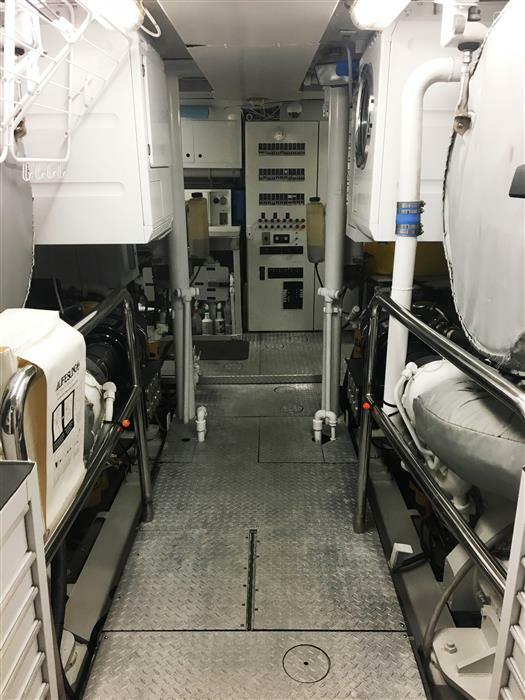 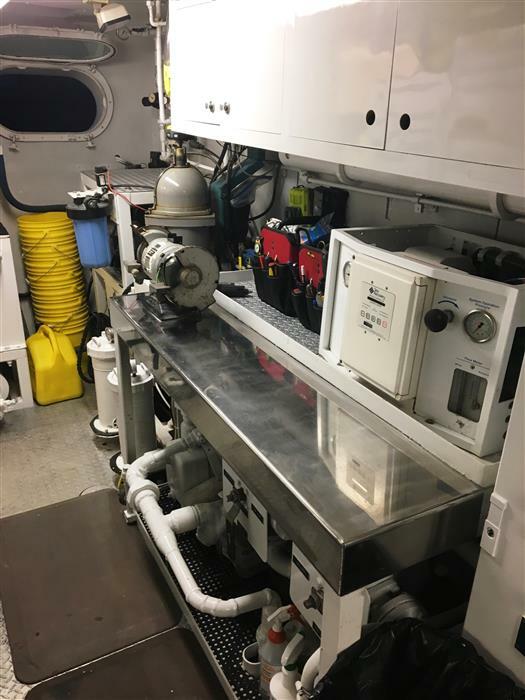 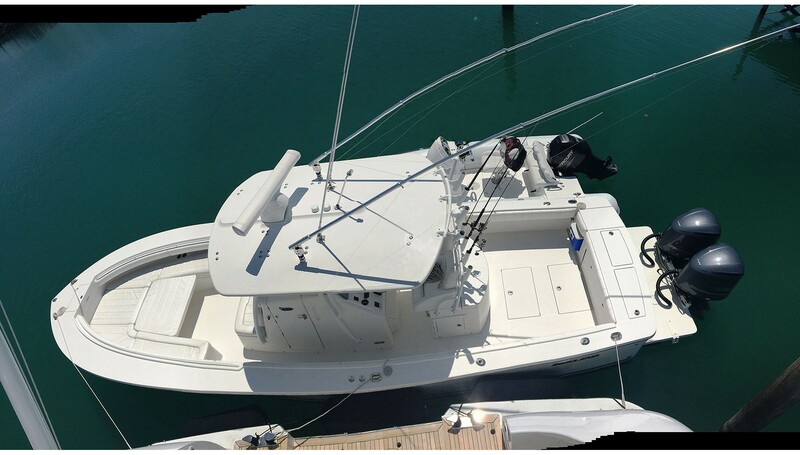 Communications include a Cellular Phone, Fax Machine, Shore Telephone Hookup, Mini M Satellite phone, Intercom throughout, WIFI at Dock side. 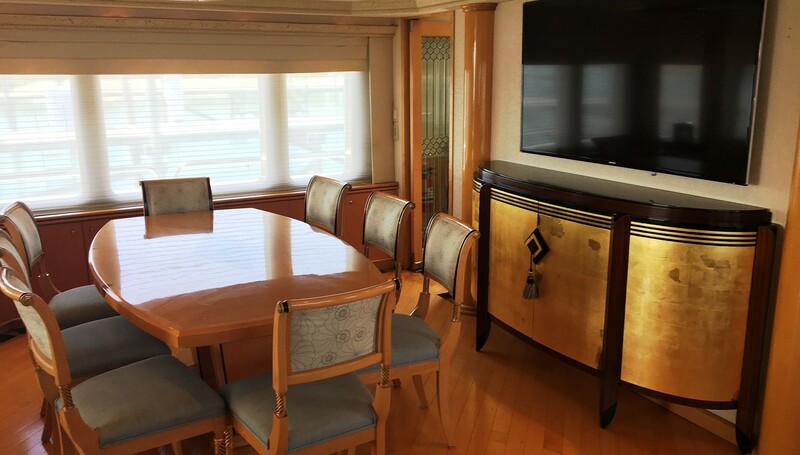 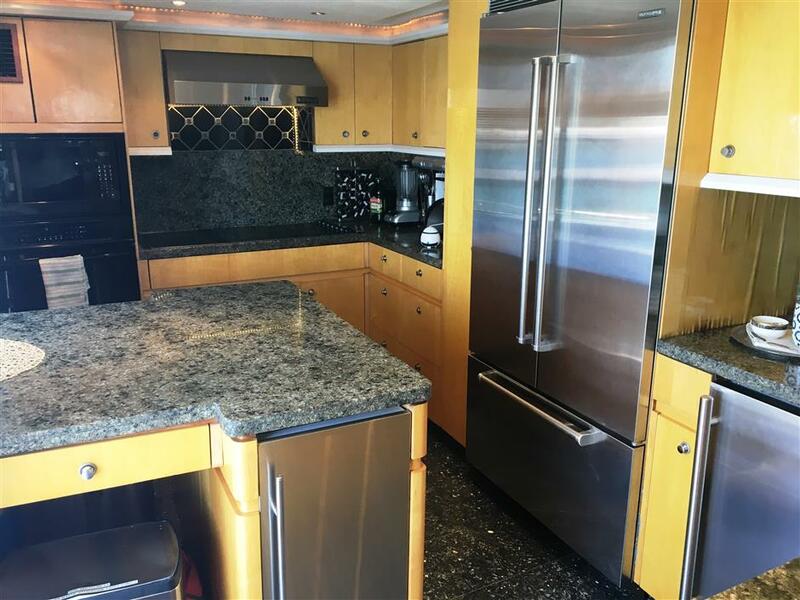 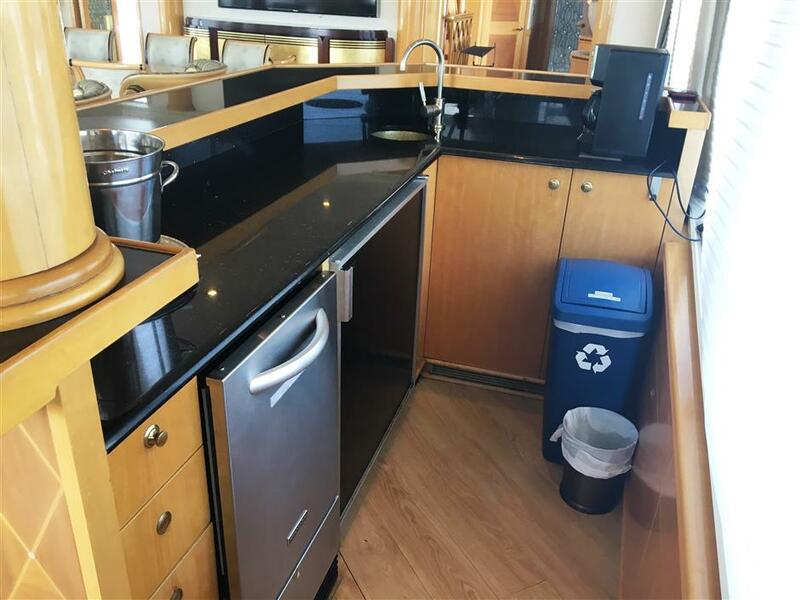 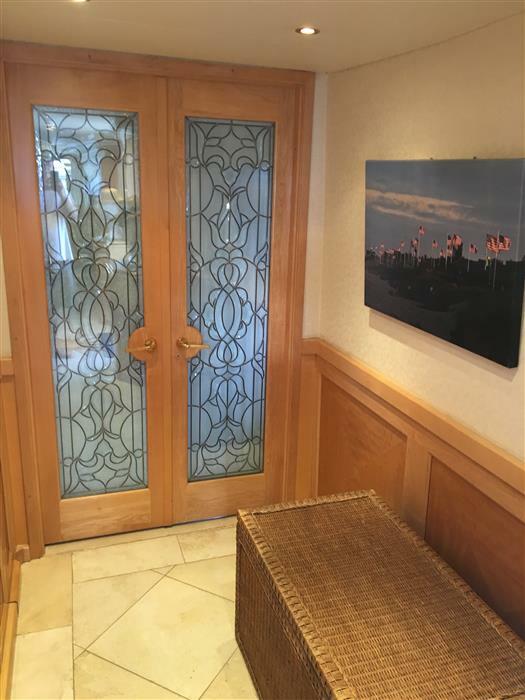 Audio Visual Equipment and Deck Facilities include Satellite TV/VCR/CD/AM-FM Stereo Cassette throughout, DVD Library, DVD in Salon, Sky lounge and Master Stateroom, iPod docking, Wii/Wii Sports, Board games, CD/iPods can be played in common areas and exterior decks.